Rapid Drug Detox can help detox you from Dolophine, also known as Methadose. Dolophine is methadone hydrochloride and has been used widely in treating heroin addiction. Dolophine is also used currently in managing moderate to severe pain not responsive to non-narcotic analgesics and is obtained in tablet and liquid form (from clinics). Due to Dolophine’s totally synthetic structure (man-made chemical), its pharmacological effects are longer lasting than those of other opiate drugs allowing for once-daily administration in pain management and opiate treatment programs. However, the pain-relieving effects are shorter than the pharmacological half-life, so that dosing for pain control usually requires multiple doses per day. As with heroin and all other opiates, Dolophine tolerance and Dolophine dependence usually develop with repeated doses. Tolerance to Dolophine administered in a pain-control program usually occurs during the first few weeks of use; whereas respiratory depression, sedation, and nausea can be seen immediately. Despite its qualities as a pain reliever, Dolophine is one of the most difficult drugs from which to break clean, and patients treated with Dolophine for pain frequently develop dependence that requires detoxification. As with heroin, Dolophine/methadone detox can be a painful process and without the help of trained professionals it can be riddled with withdrawal symptoms. Rapid Drug Detox can help free you from Dolophine addiction. Call Rapid Drug Detox at (888) 825-1020 to talk about our Dolophine Detox program or contact us to learn more. Dolophine can cause lightheadedness, dizziness, drowsiness, nausea, vomiting, sweating, weakness, headache, constipation, itching, and dry mouth. Dolophine may also cause severe and sometimes fatal heart and breathing problems. Dolophine withdrawal symptoms are typically more severe than those of morphine or heroin at equivalent doses and are significantly more prolonged. Dolophine withdrawal symptoms can last for several months or longer, so individuals maintained on Dolophinee for long periods of time may in fact find it more difficult to break free of their dependence than someone in the same struggle with a heroin addiction. Most addicts find Dolophine withdrawal symptoms too severe to withstand without medical intervention. Dolophine has traditionally been provided to the heroin-addicted population through highly regulated clinics. In recent years, Dolophine/methadone has gained popularity among physicians for the treatment of chronic pain. The increased usage has come as doctors’ search for an opioid drug that can be dosed less frequently than short-acting drugs like morphine or hydrocodone. Some physicians also choose Dolophine for treating chronic pain in patients who are thought to have a propensity for addiction. Most physicians do not realize that Dolophine is more highly addictive than traditional opiates and that ending Dolophine treatment is extremely difficult due to more severe withdrawal symptoms. Rapid Drug Detox offers affordable methadone detox program. 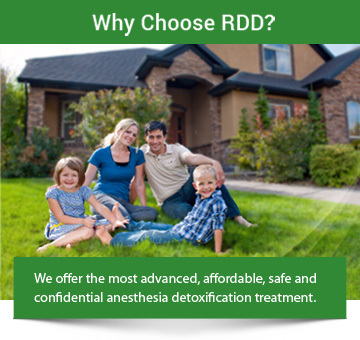 Call Rapid Drug Detox at (888)825-1020 or contact us to learn more.